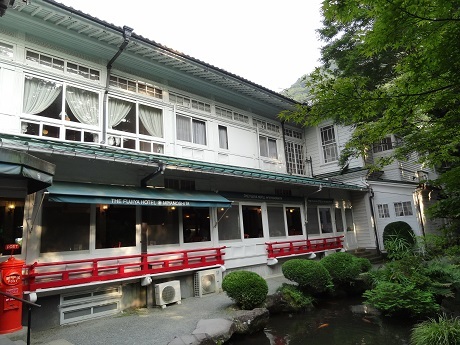 Even though the Fujiya is not, as I have said, Western, but rather Western-influenced Japanese, it seems it could not stay even that way for long, and so after WW II it annexed a Japanese-style lodging that became the Kikka-so Inn. Apparently the building was originally built as an Imperial villa in 1895 and was used by the Imperial royal family until it was purchased by the Fujiya. It must have been very odd in the first half of the 20th century having Japanese royalty staying just metres away from a busy resort hotel that was actively attracting customers from all over Japan and the world. So, having eaten my first night at the flagship restaurant of the hotel which served exquisite French food (of which alas no photos were taken), tonight it was off to the Kikka-so for a Japanese kaiseki dinner. 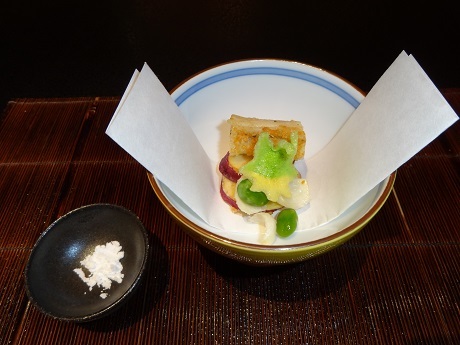 Kaiseki is basically a tasting menu that is reminiscent of nouvelle cuisine because of the simple fact that it inspired it. It has very strict rules, however, and the courses follow a set and predictable order. 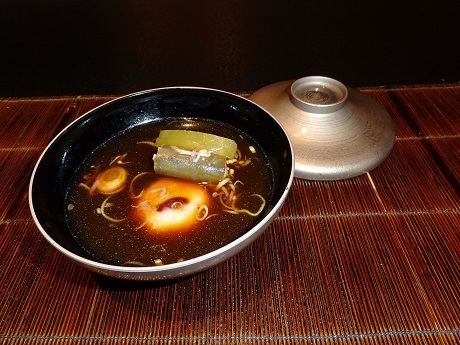 The food is highly seasonal, and so if you have a kaiseki dinner at two completely different establishments on consecutive days, you will likely find remarkable similarities in what you receive. I am no expert, but I think that the basic order generally runs something like this (the terms are my own): Pre-appetiser Appetiser Soup (usually clear) Sashimi Grilled dish Steamed dish Fried dish Vinegared dish Rice, miso soup, pickles Dessert (usually fruit and/or sorbet) But look it up on ‘tinternet if you want to know more. 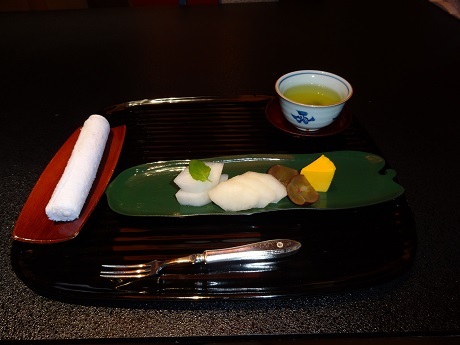 (By the way I am not talking about the “kaiseki” which has something to do with the kanji for “stone” and is related to the tea ceremony – as my Japanese teacher always used to say – “different kanji”). 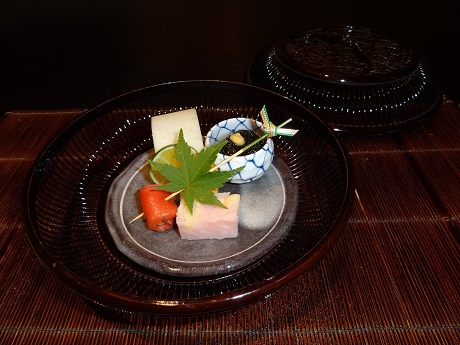 I have never before photographed an entire kaiseki meal, but this seemed the perfect chance as I was by myself. 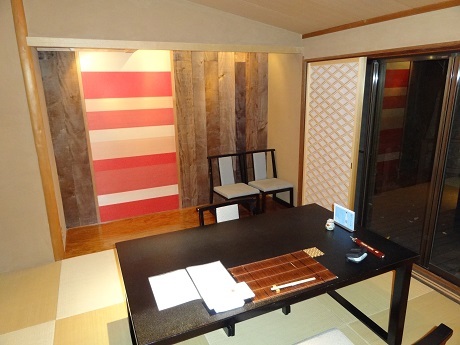 Also, somewhat unexpectedly, I was in a private room “Sazanka” which was delightful. So here is the story in pictures and brief explanation. The pre-appetiser contained crab, corn tofu and a small slice of corn, aloe (which I think is the gelatinous material on the top) and balsamic vinegar. The appetiser is a plateful of little mouthfuls of gorgeousness. At the back, covered in a strip of apple, is a piece of sushi with (apparently) barracuda on the top. The maple leaf is just for decoration. The soup is usually clear, but this one was not. 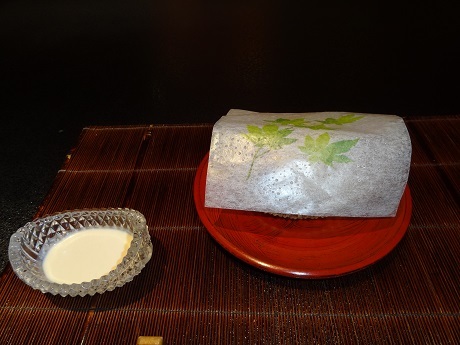 In the middle is a ball of rice cake containing fish. There is a translucent green vegetable that I think is taro stem. 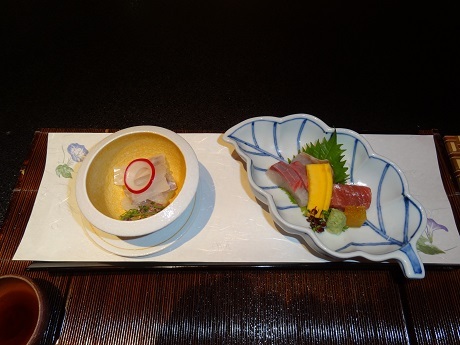 Sashimi is raw fish (sushi isn’t – it may include raw fish but it is the rice underneath that is characteristically sushi). Bottom left is the bowl of soya sauce for dipping. Tuna is almost always present, and you can see it there on the right. I think the one on the left is called suzuki but I am open to correction. And yes that is a slice of radish with the middle cut out that you can see on top. Sashimi is almost always served on top of thinly sliced daikon (giant radish) with a shiso leaf on top, which is edible and delicious. The green blob is wasabi – Japanese horseradish. 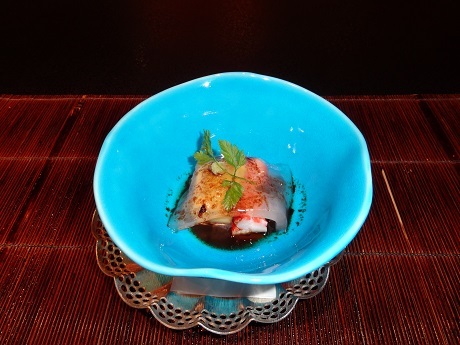 At the top was a delicious confection of abalone, cheese and edamame (kind of bean) served in the abalone shell. I was assured that it contained “bonito guts” but this ingredient did not stand out. 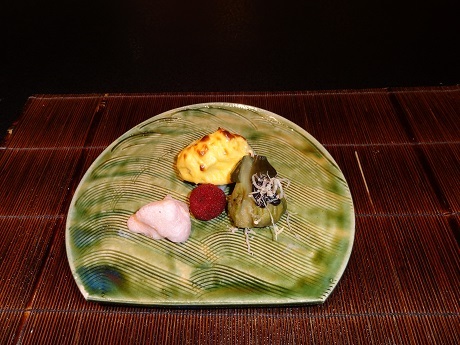 On the left the pink thing is lily bulb coated in plum paste, and the red thing in the middle is a pickled sour plum. On the right is aubergine with miso paste. This steamed dish was a cold one. It looked so lovely with the pretty paper cover that I photographed it like that, and then close-up with the cover off. 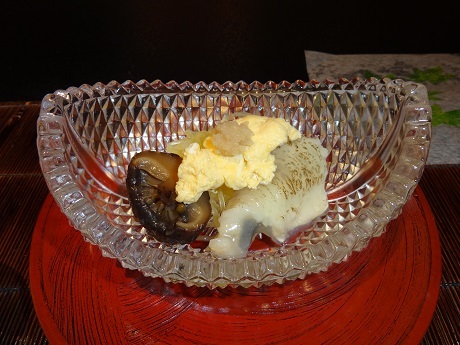 The fish is called “hamo”, which I think is a kind of eel, and that is a shiitake that you can see. The sauce was delicious and contained sesame and other yummies. The fried dish was a delight. The beans are apparently not edamame but gindan – ginkgo nuts. The thing on the top, surprisingly, was a kind of rice cracker. At the back was a piece of eel, and underneath are two slices of sweet potato, stuffed with some kind of minced prawn, and then fried. This was not a triumph. On the top you can see a scallop which was quite nice, and there was a chilli sauce which was interesting, but the whole thing sat in a slimy sauce and the translucent gelatinous thing you can see is konyaku, which is really best left uneaten. 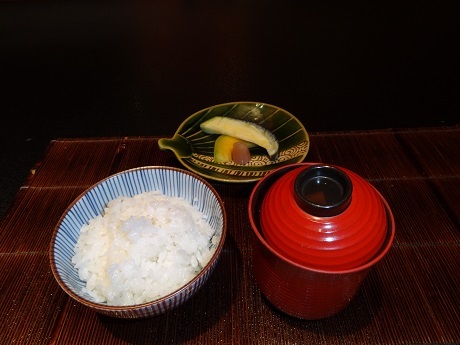 You know you are nearly at the end of a Japanese meal when they serve the rice, miso soup and pickles. This time the miso soup was replaced by a clear soup, unusually, but you can’t see that because I took the photograph with the lid on. Today’s pickles featured ginger, aubergine, and melon. No, really. So that, folks, is a kaiseki meal. Gochisou-sama deshita. The place to have tea at the Fujiya is called the Orchid Lounge, but this name gives completely the wrong impression. It is in fact a verandah running along the back of the hotel, glassed in, with a single row of tables set diagonally against the windows. There is a short return with only two small round tables, and coincidentally that is where I sat both the first time I came with Keizo, and today. 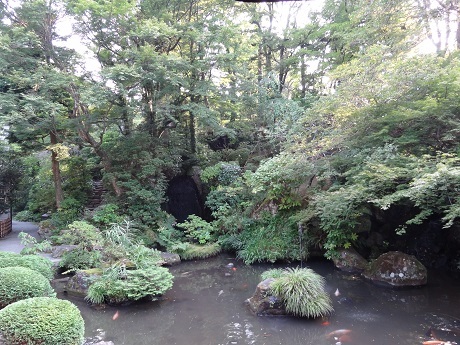 There is a beautiful view of a small Japanese garden – pond, koi carp (you can see them in the photo), the lot, that is simply exquisite. I have tried to photograph it but fear that two dimensions really does not do it justice. Above the main tables, and visible from my seat, is the back of the hotel, including a view of the window of my room. Mine is first floor (UK counting – Japanese “ni-kai”), slightly right of the centre of the picture, the window before the double doors. The green pipe that you see to the right of the double doors, incidentally, is an ancient firefighting system and inside there is a roll of flexible hose that can be connected to the end of the pipe. View of rear of main building – including my room! The menu reflects typically those things that Japanese coffee shops offer, entirely different from what you would find in any other country. Not a scone in sight – instead specials were French toast (no it wasn’t breakfast time), cinnamon toast (honestly, it really wasn’t breakfast time), and slushies – ice with flavoured syrup poured over. I plumped for a cake known as as Mont Blanc – I have never seen them outside Japan but here they are everywhere. In the less attractive form that I first came across the animal it featured only cream and marron glace paste (a smooth sweet paste made from sweet chestnuts), but he Fujiya version was a triumph – a sponge base, and identifiable bits of real (and less sweet) chestnut made it simply magnificent. 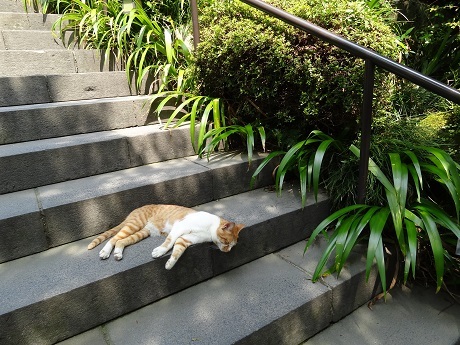 There was then just a short time to rest until dinner, which was quite a different affair. How shall I write the praises of the Fujiya Hotel? I was completely captivated by it the first time I came across it, a few years ago when my friend Keizo was showing me around Hakone. You need I think to consider a little the history. The founder Sennosuke Yamaguchi travelled to the USA and Europe and learned something of the Western hotelier tradition in the early Meiji period, and founded his hotel in 1878. 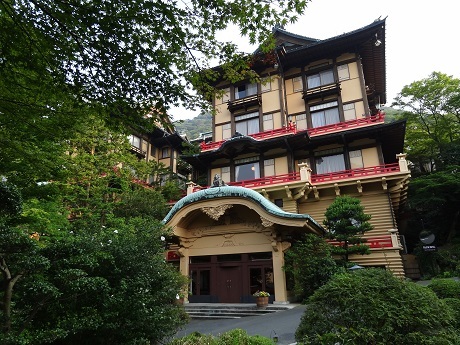 It was apparently the first western-style hotel in Japan (if this is not strictly true it must have been one of the first), in the resort area of Hakone, popular even then. The original building burned down in the Miyanoshita fire in 1883, so the current main building dates from 1891. 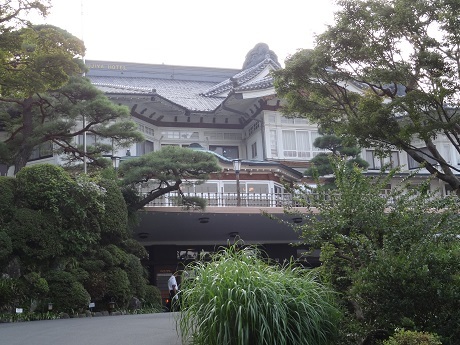 War, earthquake and fire means that even in a country so historic as Japan, Meiji period buildings are something of a rarity, so it is for me an enormous joy to be staying in an original Meiji building. When we say “Western-style” we mean “Japanese interpretation of Western style” – it does not look anything like anything one might find in the actual West. The original building and most of the later additions are actually very Japanese in character, although with clear western influences. The result for me seems like a Japanese re-interpretation of a Swiss chalet. Buildings were added in the late Meiji and Taisho periods (early 20th century), the former just after Japan’s success in the Russo-Japanese war, but I am most drawn by the two phases of later additions – one in the early Showa period, when Japan was expanding its empire in east Asia, and the second in the 1960s, when Japan was rebuilding itself. Through all these turbulent times, the Fujiya was trying to bring rest and relaxation to those in need. There is a museum in the basement chronicling some of the history, including a visit from the Showa Emperor himself in the 1960s. 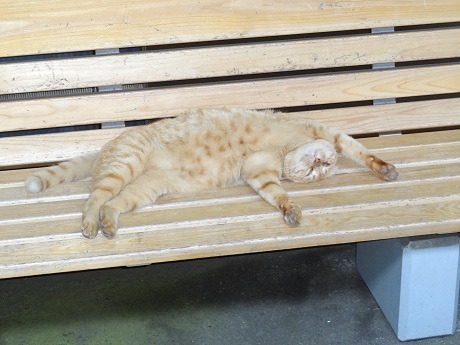 What it must have been like to be visited by a being sometime considered to be divine. 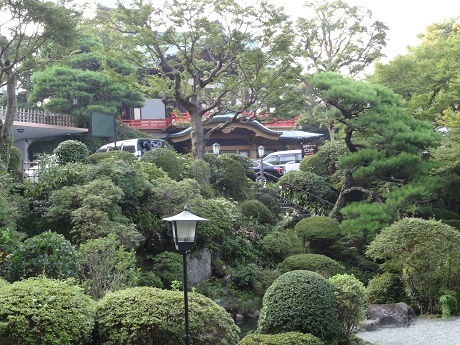 Although setting out to be a Western style hotel, the Fujiya is in fact based around that most Japanese of leisure attractions – the onsen or hot spring. 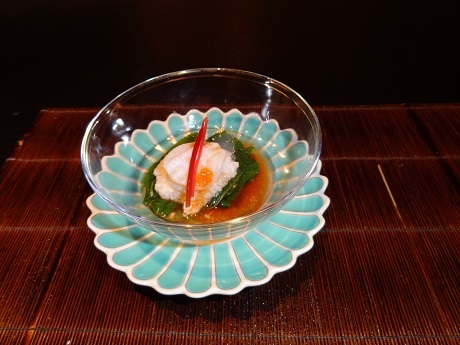 That is what Hakone is famous for, and that is what you get at the Fujiya. 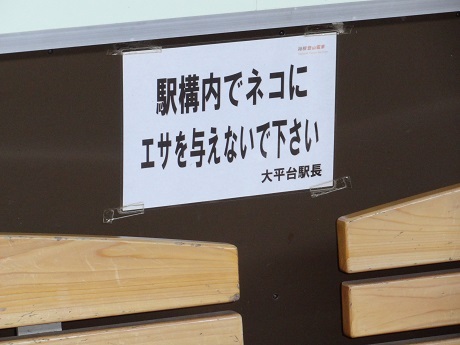 There is a small public bath (separated by gender), a large onsen swimming pool that is mixed, and for which bathing costumes are required, but then the crowning glory is onsen water piped into the bath in your own room’s bathroom, through what appears to be genuine Meiji era plumbing. Guests are advised that the hot water can take up to 10 minutes to arrive. I think it actually takes longer. The buildings are caked in layers of paint; modern additions such as electricity, air conditioning and internet are delivered in conduits attached to the original structure; and yet… And yet… The historic charm of years of people staying and relaxing here oozes enticingly out of every beam, windowframe, and wooden floortile. The service, while certainly better than anything in hotels in London, does not quite achieve the effortlessly inconspicuous ideal of the Okura, but you have to pity staff who must deal, displaying Japanese politeness, with not only huge parties of staying guests, but also streams of tourists who come, alone or in groups, like Keizo and I did those years ago, just to ogle and perhaps have tea. The building itself is very hard to photograph, set as it is upon a hill, and obscured from most directions by trees, but I will have a go. The feeling of having got away from it all is greatly increased by choosing the correct way to arrive. 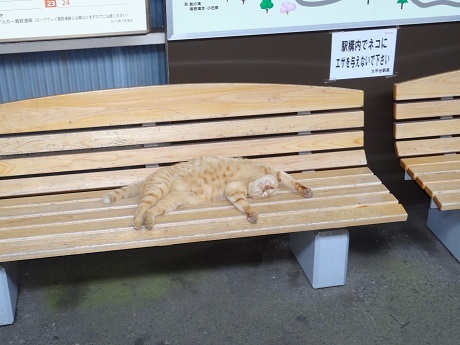 Short it is not – it took a full four hours from Narita airport. The route is this: limousine bus to Shinjuku Station bus station; Odakyu railway Romance Car to Hakone Yumoto, and then Tozan railway three stops to Miyanoshita. It is this last bit that makes it all worthwhile – the train ascends nearly 500m in altitude in a series of 3 switchbacks, at each one of which the two drivers swap ends, climbing though thick vegetation, featuring densely packed hydrangeas. It was glorious. Then you just have to heft your luggage downhill then uphill for about 500m and then you are there. A rather less welcome reminder of having got away from it all is the discovery that the nearby ATM does not accept foreign issued credit cards, followed by being politely informed by the hotel staff that they do not advance cash on cards, that there is no suitable ATM nearby, and that the nearest one that can be used is at Miyanoshita Post Office, not walkable, requiring a train, bus or taxi journey. Oh and the machine only functions until 6pm. The odd thing is that despite the remote feeling, it is actually not remote at all by any objective standard. It is on the route of the old Tokaido road – the main route from Tokyo to Kyoto, and the current Japanese Route 1. So it is actually about as well connected as it is possible to be and still be apparently in the middle of nowhere. The road, despite its impressive moniker, is at this stretch only single carriageway and very twisty. 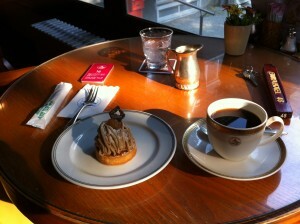 The main business of the day, however, was to have another tea like the one that had first enchanted me so much. So that is the subject of my next post.